I still play Gran Turismo 6. I play for the joy of driving in my favourite cars in the game even though I know I'll never be able to drive one in real life. Gran Turismo lets me fulfill this fantasy. And even with the PS4 having their own stable of racing games they can never match the dedication and level of what Gran Turismo has achieved on the PS3. And it saddens me that I was never allowed to join lobbies or in most cases; get kicked out after winning. Even when I set up a lobby, no one wants to enter mine. Maybe because I prefer a GT-R over a Ferrari or whatever. Racing with the AI can get dull at times I admit and it'd be nice to race with other players too. So from this period from 20/9/2015 till 26/9/2015 I'll be hosting races on Gran Turismo 6. It'll be a race just for fun. And I hope there'll be some players out there reading this too. Lobby will be open for 10 minutes before flag off. The race will be cancelled if no one shows up. That's right; the X2014 Fan Car will be used for the races. Unlike GT5, the car was not allowed for the campaign races. It's only fair now to let it earn some wins as a race car than a Time Attack car. The fan car project that started as a partnership between Red Bull Raciing and Gran Turismo continued at full throttle after the blockbuster release of Gran Turismo 5. 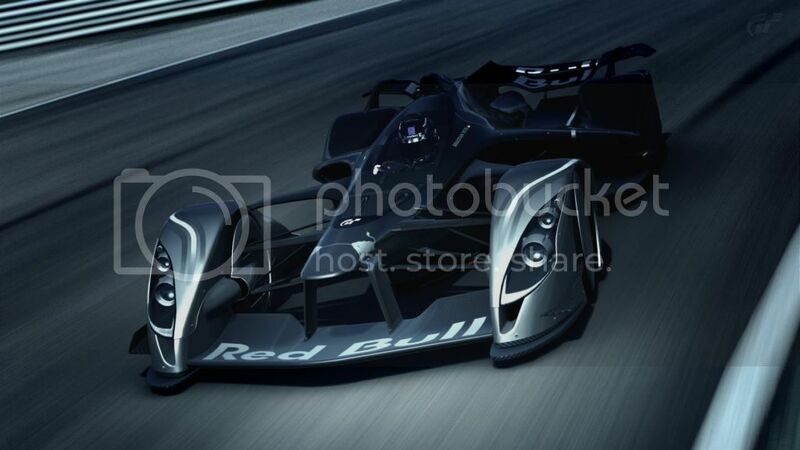 Red Bull Racing’s Chief Technical Officer Adrian Newey and Gran Turismo producer Kazunori Yamauchi further refined their radical concept to create the Fastest Race Car on Earth, no holds barred. The result was the X2014 series announced at the end of 2013 in Gran Turismo 6. At the pinnacle of the X2014 series is the Fan Car. The turbocharged 3.0-litre V-6 of the X2011 was tuned to achieve a much more tractable power curve. While maximum output was decreased from 1479HP to 1183HP, overall performance was enhanced thanks to several improvements throughout the car. Efficiency of the rear axial flow fan was improved and along with refinement of internal air ducts, the downforce achieved with the ground-effect skirt was boosted significantly and maintained regardless of vehicle speed. To complement the increased downforce, body aerodynamics were streamlined to reduce drag so that the new car is able to reach the same maximum speed without the need for an extremely high-powered engine. The refinement of the X2014 results in a vastly improved driving experience; It is the birth of the ultimate race car.